I just realised that today is a solemn anniversary which surprisingly hasn’t been marked in the media. On this day 70 years ago, i.e. 24th May 1941, the Royal Navy battlecruiser HMS Hood was sunk by the German Battleship Bismarck in the Battle of the Denmark Strait. 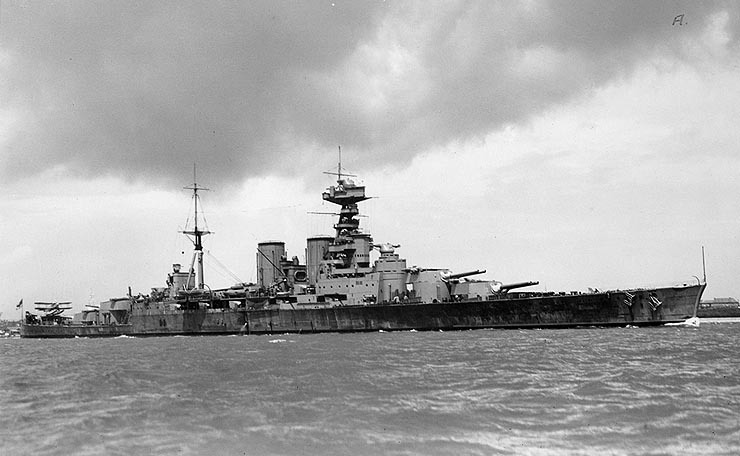 Of a ship’s complement of 1418 only three survived the sinking of HMS Hood; it was one of the greatest maritime disasters of the Second World War. I’m not one for dwelling excessively on the past, but I think it’s a shame this event has not been remembered. We owe a lot to people like the 1415 who gave their lives that day, so I’m glad I remembered in time to pay my respects. An interesting article on the BBC website about the innate nature of our understanding of geometry reminded me that I have been meaning to post something about the importance of geometry in mathematics education – and, more accurately, the damaging consequences of the lack of geometry in the modern curriculum. When I was a lad – yes, it’s one of those tedious posts about how things were better in the old days – we grammar school kids spent a disproportionate amount of time learning geometry in pretty much the way it has been taught since the days of Euclid. 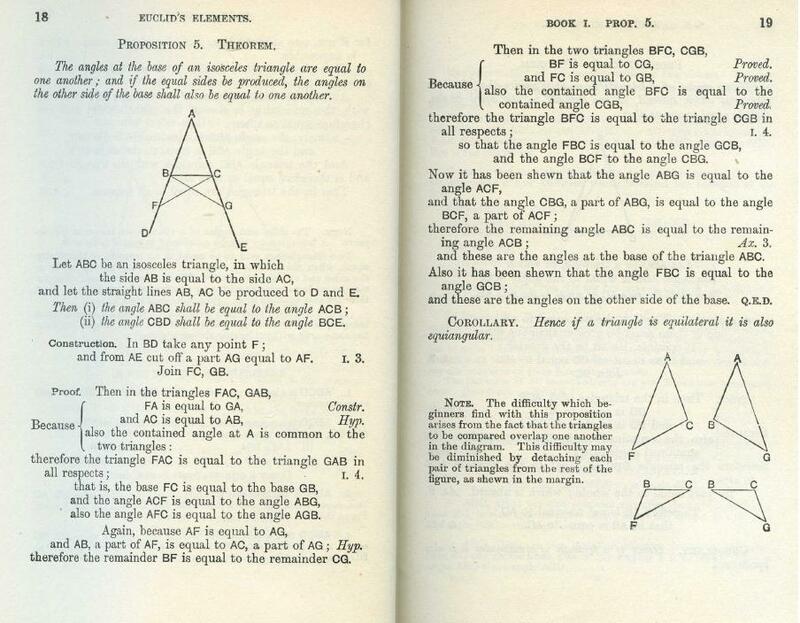 In fact, I still have a copy of the classic Hall & Stevens textbook based on Euclid’s Elements, from which I scanned the proof shown below (after checking that it’s now out of copyright). The old-fashioned way we learned geometry required us to prove all kinds of bizarre theorems concerning the shapes and sizes of triangles and parallelograms, properties of chords intersecting circles, angles subtended by various things, tangents to circles, and so on and so forth. Although I still remember various interesting results I had to prove way back then – such as the fact that the angle subtended by a chord at the centre of a circle is twice that subtended at the circumference (Book III, Proposition 20) – I haven’t actually used many of them since. The one notable exception I can think of is Pythagoras’ Theorem (Book I, Proposition 47), which is of course extremely useful in many branches of physics. The apparent irrelevance of most of the theorems one was required to prove is no doubt the reason why “modern” high school mathematics syllabuses have ditched this formal approach to geometry. I think this was a big mistake. The bottom line in a geometrical proof is not what’s important – it’s how you get there. In particular, it’s learning how to structure a mathematical argument. That goes not only for proving theorems, but also for solving problems; many of Euclid’s propositions are problems rather than theorems, in fact. I remember well being taught to end the proof of a theorem with QED (Quod Erat Demonstrandum; “which was to be proved”) but end the solution of a problem with QEF (Quod Erat Faciendum; “which was to be done”). When you have completed many geometrical proofs this way it becomes second nature to confront any problem in mathematics (or physics) by first writing down what is given (or can be assumed), often including the drawing of a diagram. These are key ingredients of a successful problem solving strategy. Next you have to understand precisely what you need to prove, so write that down too. It seems trivial, but writing things down on paper really does help. Not all theorems require a “construction”, and that’s usually the bit where ingenuity comes in so is more difficult. However, the “proof” then follows as a series of logical deductions, with reference to earlier (proved) propositions given in the margin. This structure carries over perfectly well to problems involving algebra or calculus (or even non-Euclidean geometry) but I think classical geometry provides the ideal context to learn it because it involves visual as well as symbolic logic – it’s not just abstract reasoning in that compasses, rulers and protractors can help you! I don’t think it’s a particular problem for universites that relatively few students know how to prove the perpendicular bisector theorem, but it definitely is a problem that so many have no idea what a mathemetical proof should look like. Come back Euclid, all is forgiven!